"Protein, schmotein. Just make sure it's tasty." Kitty's reached his golden years. He's still the same fine feline, perhaps a bit less active and with a slight hitch in his get-along. While he might benefit from a special senior diet, sometimes with lower protein content, don't make any changes without consulting your vet. Felines are obligate carnivores -- they must consume meat and require more protein than dogs, according to PetMD. Whether the commercial food you feed your geriatric cat contains low or high amounts of protein depends on any underlying health conditions. Don't make the assumption that old cat equals low protein diet. 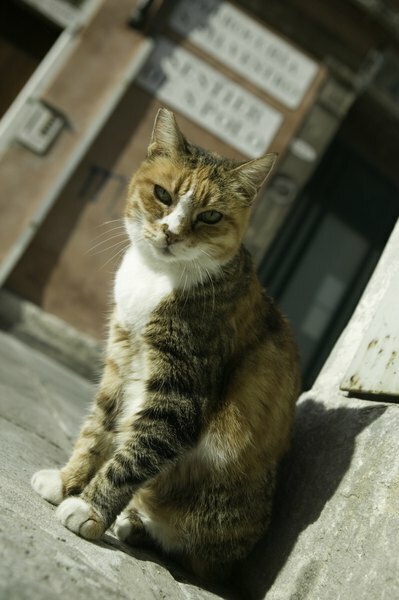 Felines with some common geriatric cat diseases actually do better on a high protein food. You've always taken your cat to the vet for annual check-ups. Once Kitty reaches the age of 7 or 8, your vet might recommend semi-annual visits to nip potential problems in the bud. Adjust the protein levels in your cat's diet, if necessary, only when you and your vet know the state of Kitty's health. Kidney disease occurs fairly often in older cats. Symptoms include increased thirst and peeing, along with weight and appetite loss. Unfortunately, by the time your cat exhibits symptoms, 70 to 75 percent of his kidney function is generally lost. Your vet performs blood tests and a urinalysis to make a diagnosis, but further testing, including ultrasound or X-rays, might be necessary. If your cat suffers from chronic renal failure, dietary changes can slow kidney deterioration. Your vet might prescribe a special kidney diet, which contains low amounts of phosphorous and lower, quality proteins such as liver or turkey. Some symptoms of another common older cat disease, diabetes, overlap with those of kidney failure. One exception is lack of appetite -- the diabetic cat always seems hungry. Once your cat is diagnosed, you'll have to give him daily insulin injections. However, dietary changes also come into play. It's also important to keep Kitty at a healthy weight. Diabetic veterinary diets contain high levels of protein and low levels of carbohydrates. Feline skeletal muscle mass loss doesn't receive the attention of other aging cat issues, but it's a common problem in the older cat. Although sarcopenia, the formal term for the condition, has many causes, one major culprit is protein deficiency. Reducing your geriatric cat's protein levels for one underlying health issue might trigger another. There's not an easy answer to this dilemma, but feeding high quality protein, rather than just a lot of protein, can help. If your old cat hasn't been diagnosed with any specific illnesses, ask your vet about feeding a diet containing easily digestible proteins. Why Can't Some Cats Digest Dry Food?